Well, the title of the posting is kind of redundant. 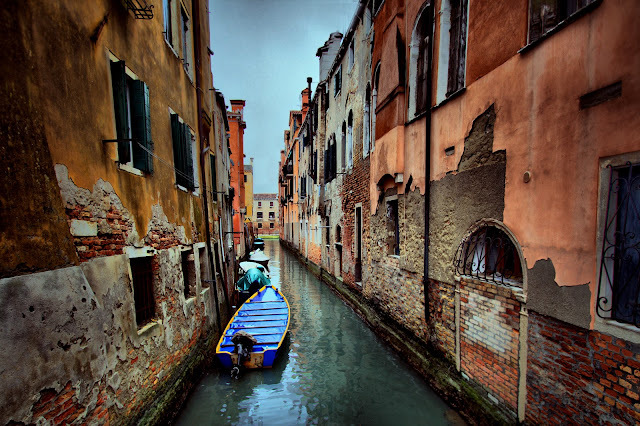 Venice is full of canals. This one I took a nice HDR of, though. This is an HDR of 3 RAW files, processed in Dynamic Photo HDR. I have started to enter the RAW files straight into the programm as CR2-files. Before I used to develope my CR2 in dgn first, then into TIFF and then into the HDR software. I have stopped doing that, though, when I found out that my program can take the CR2. This keeps as much information undamaged as possible. This canal in the ghetto is a typical one for that part of town, I think. The Ghetto is the old Jewish quater of Venice. Because of this place the quaters of Jewish population are called Ghetto in other places. Finally the term got a different meaning and is now used differently.